I inherited my love of reading from my mother, who in turn had inherited hers from her mother. Mum’s opinion, expressed regularly as I was growing up, was that one should always have a book with them. I bought into that pretty early on. Mum has always loved literature. When she graduated from high school, she went to university to study English Lit. She finished the major, but dropped out of university when she had only 3 months left to go on her degree, mostly because they wanted her to do history subjects that she hated. About 25 years later, she went back for another try, starting over completely. This time, able to choose exactly the subjects she wanted to do, she made it through easily – with majors in English Literature and Psychology. While I’ve always loved reading, I don’t love the study of literature. I am not one to stop at every word and analyse where it came from and what it means. In high school, we studied In the Skin of a Lion, by Michael Ondaatje. I hated that book from the first moment – I didn’t find the story remotely satisfying, and the fact that we then had to go through just about word for word to extract further meaning… well, suffice to say, the impression didn’t get any better. What I mean to say by these paragraphs, I suppose, is that I read for story – I read because I want to know what happens in the end, where the story will go, and for the twists and turns along the path. I don’t enjoy reading that requires me to analyse each word to eke out where that story is actually going, what it is actually meaning. 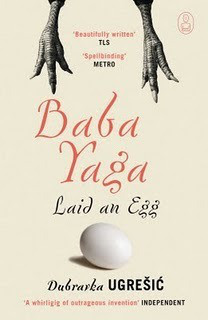 Baba Yaga Laid an Egg is a well written book, and won the Tiptee award in 2010 (recognising Sci Fi or Fantasy that explores or expands understanding of gender). It is the retelling of the Baba Yaga myth set in the modern world. As such, while it does classify as fantasy by genre, there really isn’t much fantasy about it. It is written in three parts: the story of an author and her relationship with her elderly mother, with a cameo from a somewhat stalkerish fan who is a folklore scholar, followed by the story of three elderly women who go on a trip to a spa, and finally, written from the perspective of the aforementioned stalkerish/folklore scholar, an explanation/analysis of the Baba Yaga myth as it relates to the previous two sections. I didn’t know a lot about Baba Yaga to start with. Maybe this was part of what I was missing: because I only knew bits and pieces, I missed the relationship of the story to Baba Yaga. But even if I had known the story, I have my doubts that I would have recognised the references on my own – for example, a fuzzy boot being an analogy for a mortar, which in turn represents a womb. The first 2 sections were certainly entertaining and I did enjoy reading them, but… I suppose, to me, there didn’t really seem much point to them. The third section is interesting, but quite dry. It ties the previous parts to the myth, but I found it fragmented and not particularly engaging… quite difficult to get through. Though I finished the other sections weeks ago, I put it down half way through the third, and it’s taken me until now to pick it back up again. There were also little things that annoyed me, such as the ending paragraphs in the second section which really grated. They didn’t seem to need to be there. Every time I encountered one, I felt irritated. They all follow a similar theme, such as: And us? While life is often gloomy and cheerless, the tale runs on, bright and fearless! When it comes down to it, Baba Yaga Laid an Egg just isn’t my type of book. With that said, though – I’ve already told my mother about it. She thinks it sounds interesting, and plans to take a look. As much as I can guess, I think she’ll enjoy it. Year: 2010, first published in English 2009, first published 2007.